I got a call from a friend that Republic TV reporters are creating problem in front of Social Science department. I reached there as soon as I could. There were students – 20 to 25 to be precise, and they were standing confused of what to do. There were two male cameramen from Republic, and two female reporters. I went and respectfully asked the first cameramen to stop the recording and move out. I said, ‘I know it is your job to do this but we don’t want you here, please leave’. The cameraman was a gentleman, and immediately detached his camera from the monopod. Things were peaceful until this reporter came to me and shouted, ‘who the fu*k are you to tell me what to do, we are not leaving. We have been invited by the union President’. ‘With due respect, Ma’am, I am afraid you are mistaken, I have confirmed it with the union president and the university Public Relations Officer, you are not invited here. Please leave’, I replied. 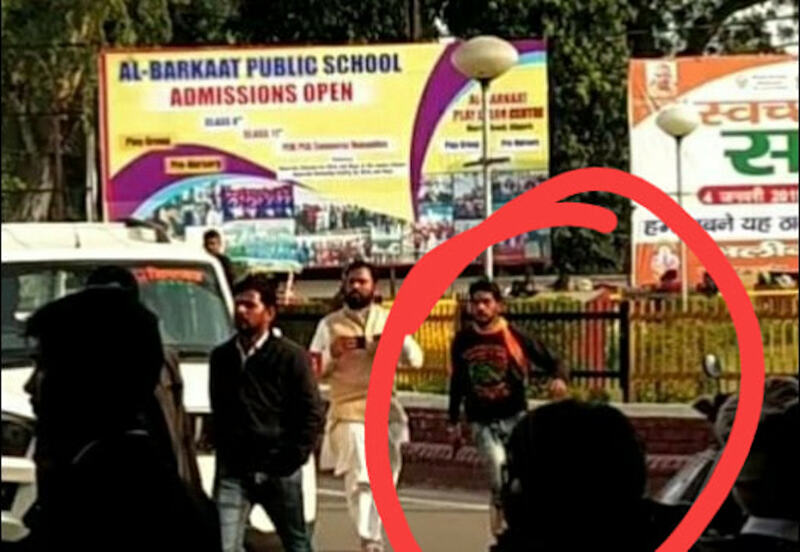 The cameraman interrupted saying, ‘Dekho kaise fadta hu tum logo ki’ and he signalled the reporter to start reporting and she went, ‘We are reporting live from the university of terrorists..it seems..the students are trying to attack us. AMU is showing its colour (pointing to the students who were standing there to see the scene)’. I, along with another senior immediately went to the cameraman and tried to stop him from recording. He literally pushed me back and stabbed me with his pen, shouting and abusing. The other two female reporters went strangely very very loud and started telling us that we are manhandling with her. One of them came really close to us, and then got in argument with Anas bhai. ‘We are not going to get intimidated by you terrorists’, she said. All this was happening in front of the social science department. They moved towards the gate, and stopped near the department of Mass communication, and started reporting back with the camera pointed towards the students. Since this was happening on road, the people passing by stopped to see what was happening. This was Union Cabinet member Gowtham K bhai went to ask them to stop the recording and leave. Gowtham bhai was abused and manhandled, and the crowd rushed towards them. One boy pushed the reporter and kicked him. Few more students followed but they were stopped by Anas bhai and Gowtham bhai. The students at the background were shouting, ‘Go Back’, ‘Maaro’ and ‘Tod do’. However nothing of that sort happened. From what I can recall, the cameraman and his camera were completely fine when they moved out of the varsity gate. What happened outside the varsity gate was a completely different issue. I had no clue of what was going to happen next, so I went to Kennedy auditorium to prepare for the screening we had planned. After an hour or so, we got to know that Ajay Singh Thakur (Aligarh MLA’s grandson) along with members of BJP were marching towards varsity gate to stop a meeting in which they believe Asaduddin Owaisi was present. The whole Asaduddin Owaisi thing was going on in local media for a couple of days, although Owaisi was never invited to the meeting. It started with Ajay Singh’s remark published in a local Hindi newspaper which said, ‘Owaisi jaiso ko Aligarh me nahi ghusne denge’ which was followed by similar remarks from Hindu Mahasabha, Bhartiya Janata Kisan Mahasabha, local BJP leaders. When the BJP members reached the campus gate, Union members and students were already present there to stop them. One of the BJP goons fired bullet at union secretary Huzaifa Amir. The students went violent and burnt his bike. The BJP guys left for nearby market (Dodhpur) which is a Muslim majority area and forced people to close down their shops. Later they went to the nearest police station and started demanding arrest of the students. The students sat at the varsity gate to protest against the BJP guys demanding their arrest. The Republic team was there all the time, reporting the series of events that unfolded. The police was there and did nothing. I still have no idea what was Republic doing there, unless they knew that BJP guys will come to create violence. That is all I know.